This unique twist on a familiar story serves as a prolonged exposition for Pearl Harbour, focusing on a group of US soldiers in the lead up to the infamous attack. 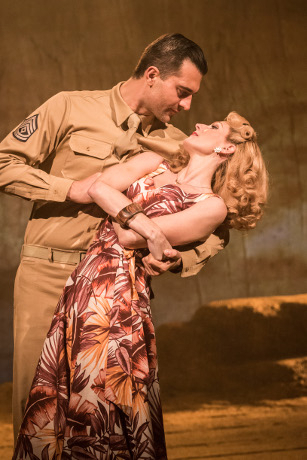 From Here to Eternity, adapted from James Jones’ 1951 book with lyrics by Tim Rice, tells the story of Private Robert E. Lee Prewitt as he leaves the familiarity of mining town Kentucky and joins G Company, a military unit based in Hawaii. Drafted in as a hope for the company’s boxing team, Prewitt (Robert Lonsdale) refuses to fight as he promised his mother on her deathbed that he would not hurt anyone unless absolutely necessary, alienating him from the other soldiers. He spends a lot of his time at the local gentlemen’s club with his only friend from the army, Private Angelo Maggio (Ryan Sampson), and quickly falls for a girl he meets there, Lorene. As the soldiers’ lusts are tantalised, Sergeant Milt Warden (Darius Campbell) has noticed officer’s wife Karen Holmes (Rebecca Thornhill). They embark on a dangerous affair, with Warden risking a 20-year prison sentence. 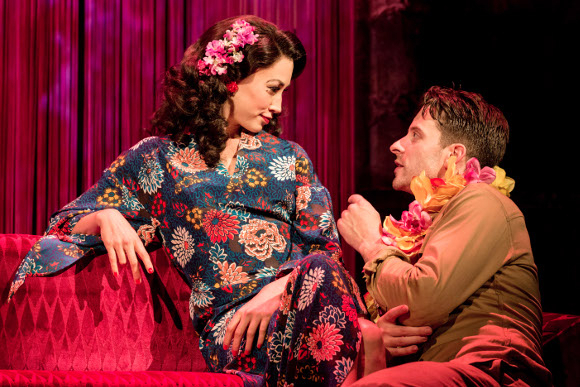 Prewitt’s relationship with Lorene (Siubhan Harrison) begins with a rather frosty, abrupt encounter which risks alienating the Lorene and prevents the instant connection with a female love interest the audience craves. Harrison only becomes more endearing in her role as she softens throughout their encounters, but her solo Run Along Joe is very stong. With his vulnerable nature and righteous personality, Lonsdale holds the audience in the palm of his hand and his version of Fight the Fight cements his status as a rising star within musical theatre. Sampson creates a loveable companion for Prewitt in the form of Maggio. However, alongside his humorous scenes and jovial personality, he handles powerful scenes of homophobia and abuse within the police force and military establishments with a rawness that captivates the audience in the ironically named I Love the Army. The chemistry between Campbell and Thornhill drives their scenes, giving tender moments to a show that could easily be overpowered by the testosterone-driven desires of the young soldiers. Thornhill seizes Rice’s lyrics and interprets them perfectly, creating a tender and identifiable character beneath her harsh exterior. Her moving rendition of More than America, with Campbell and company, creates an intriguing Act One finale, alongside a surprise reveal. The military-style choreography by Javier de Frutos incorporates the harsh, and at times degrading, training into the show without interrupting the flow created by Bill Oakes’ book and Rice’s lyrics. Soutra Gilmour’s set is simplistic at times, with its distressed walls and tilting floor, but this works well to reflect the basic military lifestyle. 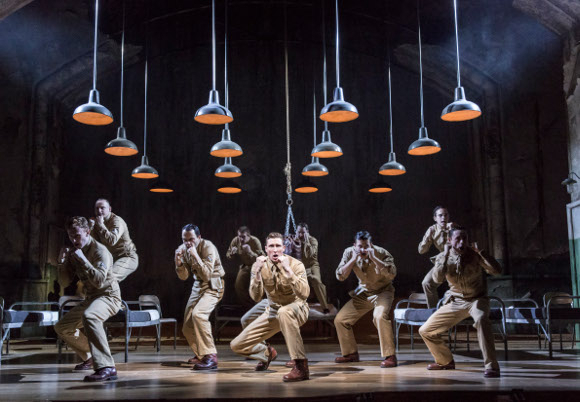 Instead of fixating on the Pearl Harbour attack, this take on the historic events explores the lives and loves of the victims of the attack, delaying the horror the audience is anticipating to create a powerful piece of theatre that creeps up on you. From the moment Warden utters the throwaway comment “luckily for you that war is not going to stay away forever”, you know these are men on borrowed time.